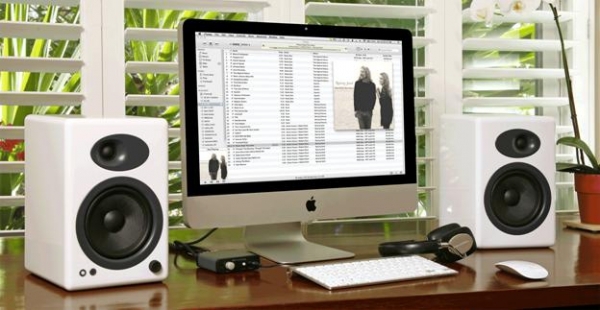 I've heard really great things about these speakers, so they would do awesome in my office. I'm currently running the built in speakers on my lappy and some Logitech something or other's on my desktop. I don't particularily like the sound that I'm getting so I more often than not push the sound (Air Play) to my Home Theater if I need good sound (Harman Kardon 3600 + Jamo speakers and a Martin Logan sub). My current solution also is using my laptop speakers, and the quality of music isn't very good. I'm a college student so I really can't afford speakers right now...winning these speakers would be awesome. I review music for my school newspaper, so having good quality speakers would undeniably help me out with my job. At home I connect my laptop to my home stereo. Cerwin Vega speakers, Sony Receiver. At the office I use some cheap speakers that I plug into the headphone jack. I don't know if the Audioengine speakers will sound better than what I have at home, but there's no doubt it will improve things at the office. I'm guessing that these would sound better than the speakers in my Thinkpad. I currently have a loner set of Logitech Z-1's. When we moved to Ohio, I sold my then current setup of Kenwood amp and JBL speakers, with the intent of building my own. Haven't yet had the time to finish the project. In the mean while, my brother in law let me borrow the Z-1 that he wasn't going to use for the foreseeable future. I'm pretty sure he's ready to take them back anytime. So there you have it, the A5's would improve my sound, since technically I wouldn't have any. These will be a big improvement from my blown out Boston Acoustics computer speakers! Currently I use my macbook pro speakers or my headphones. When I'm down in my room I can plug my computer into my boombox but that still isn't optimal. I need some professional type speakers like these for my room when I'm producing mixes for songs I record with others or drum covers I do with a friend. Sound quality is key for me.